This beautiful wedding at Kortright Centre for Conservation was one of the most emotional events I have ever photographed in my long career as a Toronto wedding photographer. From the bride and groom, family and guests to the floor book girls and ring bearer, everyone had a great time and sometimes laughter's were also peppered by tears of joy. The duty of any professional wedding photographer is to tell the story of the big day in an artistic manner. There are multiple techniques one can use but the ones that prefer the most for visual storytelling is that involving multiple stories. The key element in creating a compelling image is creating a series of layers in which the protagonists do different things. 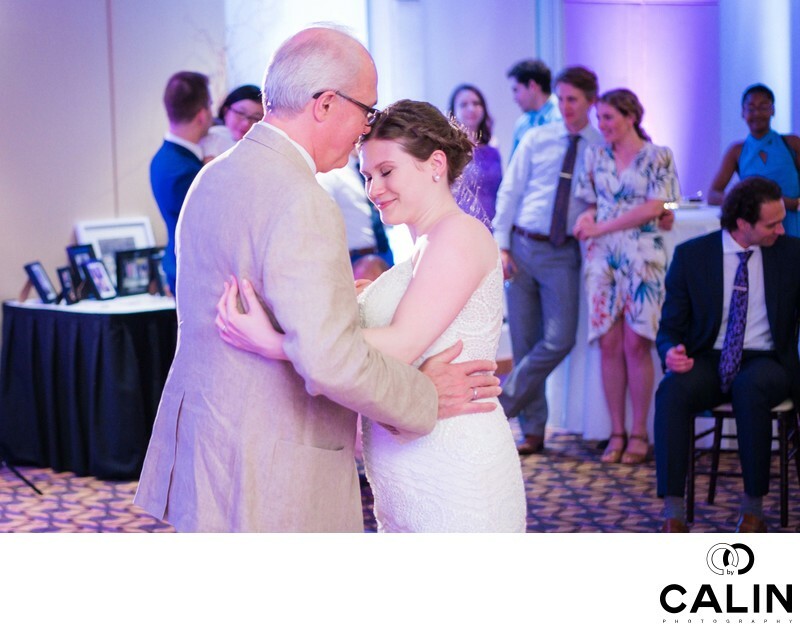 In this photograph, in the foreground we can see the father of the bride dancing with his daughter. Both of them are smiling and are keeping their eyes closed to fully enjoy the moment. In the background we can see the guests interacting. In an ideal world, all the guests would be looking at the bride and her father in would create virtual leading lines emphasizing the importance of the subject in the frame. However, in this image very few people pay attention to the father daughter dance, which makes the picture look very natural. The colours in this image are very pleasing. The blue uplighting complements the tungsten light of the venue and the skin tones creating one of the most appealing colour schemes for the human eye. The picture was shot in the landscape mode with a Fuji XT2 camera on which I mounted a 23mm f1.4 lens. While I agree that in wedding photography the type of camera or equipment is not crucial, in an oversaturated market such as the one in the greater Toronto area, every single detail that offers a sustainable competitive advantage helps. Yes, none of my couples hired me because it takes good reception photos but in order to deliver the story completely, the artist has to master the skill of taking night shots. Also, because it is very difficult to focus in low light, very few guests can take decent images during the reception. That is the moment when a professional photographer can shine. Invariably, during the special event there will be use that come to me and talk about equipment and also show me the pictures they took during the wedding ceremony. However, I have yet to see a guest take good reception pictures. The fast-paced rhythm, combined with low lighting and movement constitute insurmountable challenges for the vast majority of cameras and cell phones. For all the couples who are getting married at the Kortright Centre for conservation or elsewhere, please pay attention to the traditional dances. It is respectful and looks good in the pictures. Also, ask your DJ to announce the first dance and the father daughter and mother son dances and gently suggest that you are guests enjoy a those moments as opposed to taking pictures. The bride and groom would rather see your face in their shots and not your cell phone.